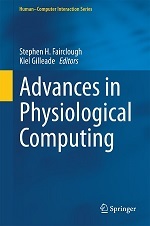 The Physiological Computing website is aimed at providing the latest news and research in the field of physiological computing (see F.A.Q.). The blog was co-created by Stephen Fairclough and Kiel Gilleade in 2009 with moral support by Jen Allanson. Click the author’s name to see their most recent blog posts. We are interested in publishing articles on a wide range of physiological computing topics inc. muscle interfaces, BCI’s, biocybernetic adaptation and ambulatory monitoring. Articles can be as formal or informal as you like, whether it’s a discussion of your latest research findings or some mad idea you had the previous evening – all are welcome. PhysiologicalComputing.net was closed in February 2015, please see our sign off post for more information.